Tips and advice – get a Contract and public liability. Make it your show business policy to provide or insist on a written contract for all your engagements and gigs regardless of what it is or who it is with. A verbal contract is legally binding but sadly these days you can not rely on promises and handshakes. Make sure you provide or obtain a clear written contract regardless of who it is with or what has been agreed. Contracts don’t have to be pages and pages of laws, rules and regulations. They just need to be a clear summary of what has been agreed and terms and conditions. A written contract should legally protect all involved, don’t agree to anything you are not sure about, clear or unhappy about. If all is well everyone should be happy to sign once an agreement has been made, or within days by post or email. In the UK and the USA, this has become normal show business conduct and practice. Contracts – The Modern Day Handshake. 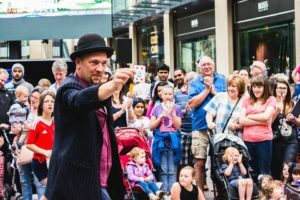 Even some street performing festivals around the world have started to insist that buskers should have public liability and sign a basic contract. Get legal cover or at the least public liability – We are members of Equity – a performers union and I have been with them for close to 2 decades and have found them to be very helpful. 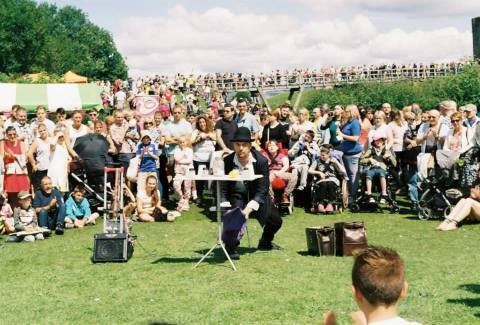 Mario Morris and Veronica Morris perform a fully self-contained family magic show. They provide their own public liability up to the sum of £10 million pounds each. They are also responsible for their own taxes and national insurance contributions. Book with full assurance.